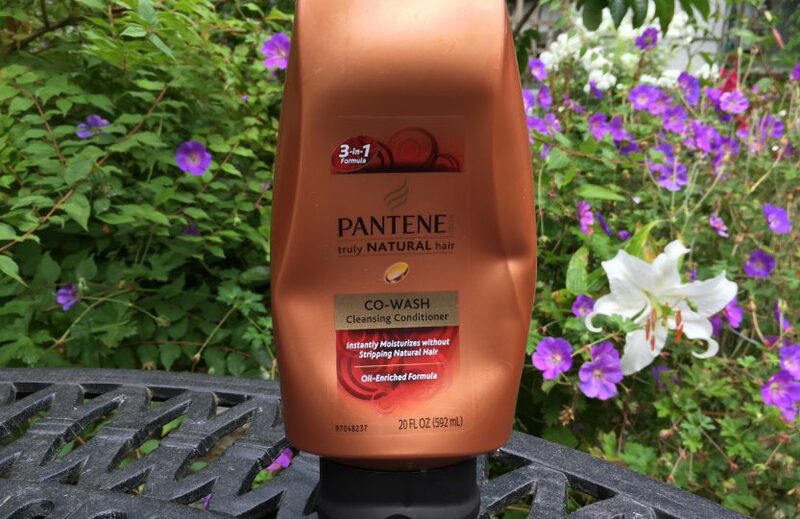 Pantene’s Truly Natural Hair Co-Wash Cleansing Conditioner feels just like you’re washing with a conditioner. So tonight when I was using it, I wondered what was in it that was making it lather a little as it felt so mild, as if there wasn’t really anything cleansing. It really felt like I was just using a conditioner. So I checked out the ingredients again. Didn’t you do that already you might ask. Well, when I first check out a product I just check for bad ingredients. So when it passed, I tried it. 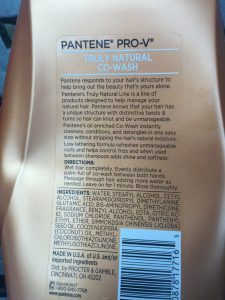 To my surprise on checking the bottle tonight, there were no actual “shampoo ingredients” at all. So this is a conditioner. Not really a shampoo. It turns out the lather comes from the cetyl alcohol most likely, which just happens to lather a bit (it’s often added to products to increase the lathering. Lathering is different from cleansing. You can lather and not cleanse, which many of these mild conditioners are doing. They add a bit of lathering so you feel like you’re cleansing, but you’re really just lathering with conditioner ingredients). To experiment, I rubbed the Pantene conditioner in my hands, and it lathered a tiny bit too. So that means you really can just use conditioners as shampoos if needed. However, this “cleansing” conditioner does contain salt. So you need to rinse it out really well. I don’t like salt in leave in products. I don’t really like it in rinse out products, but since it’s being rinsed out and it’s in such a small amount, it’s fine. So long as you rinse it out.